Sara and Jesse had one of the most dance-crazy crowds I’ve seen in a long time. They were out on the dance floor doing handstands and flips, dancing on top of boulders and chairs, carrying each other around on their backs, pulling in grandparents for a hip-hop beat. Crazy fun. And one of their wedding dancing photos won a spot in the recent ISPWP wedding photography contest. But more than the dancing, Sara and Jesse were a delight to work with. Jesse is a theater lighting designer, so he had a great time designing the lights in the reception tent, which he and his friends strung up the night before. And Sara… well, she’s as beautiful as a bride gets. 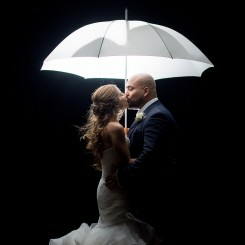 You can see more of Sara and Jesse’s wedding photography on my website, or their wedding slideshow. The bride and groom live in Chicago, but Sara’s family is from the Portland area. So they had a destination wedding at Youngberg Hill Vineyards and Inn. Be sure to check out Youngberg Hill Vineyards for one of the most stunning wedding venues in Yamhill County, Oregon! I love to design wedding albums. With a history in graphic design, fine art, and photography, the album is a culmination of over a year’s work in telling someone’s wedding story. So for Sara and Jesse’s wedding, I wanted to show both the beautiful venue, and the fun the wedding party and family have together. Incorporating colorful image backgrounds behind the unfolding wedding story, and published in one of our stunning Coffee Table Books, Sara and Jesse now have an heirloom their children and grandchildren will enjoying for decades to come. 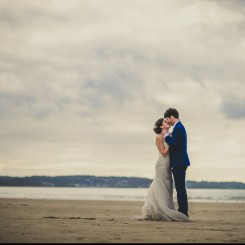 We just celebrated our one-year anniversary and I am so thankful that we have these beautiful photos to remember our wedding day. The actual event goes by so quickly; it means a lot to have these memories. I love mine and Aaron’s wedding reception book. I constantly flip through our copy and my mom’s. I love reliving the day. That was the most important item for me to have from that day and I still think it’s the best thing we purchased. Thank you once again.